“Walking in the Winter Wonderland” a favorite of many, is a terrific description of what one feels like, when they enter the Briar Patch. Christmas trees all a glow, more than one can imagine, Jolly ole’ St. Nicolas’ (Santa) everywhere, even a huge one that seems to be hanging on a trapeze wire, bears like teddy and polar, reindeer, snowmen, penguins, and carolers can all be found along with “Jingle All the Way,” spelled out on the wall. The Briar Patch located on St. Rt. 104 near Lucasville, has always had a unique style, but for those who do not know, at Christmas time, the ‘Patch’ literally comes alive. Any Christmas decoration one can think of, is probably up in a lofty area of this golden store. 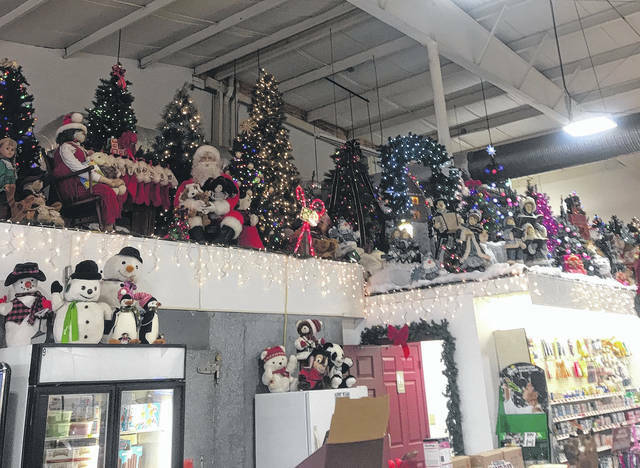 Rita Garlinger Shumway, owner of the Briar Patch said that originally it started out small, but has now grown into a magical Christmas display that seems never ending around the store. Shumway grew up in South Webster and then moved out to the Lucasville area and bought the Briar Patch. 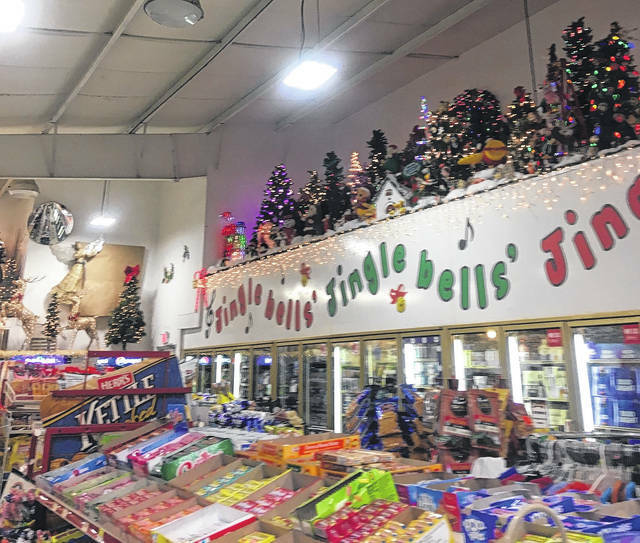 While growing up in South Webster, Rita remembered the little store in town, called Simmering’s Market, owned then by the Simmering family(Wink and Vivian), and their daughter Tammy. 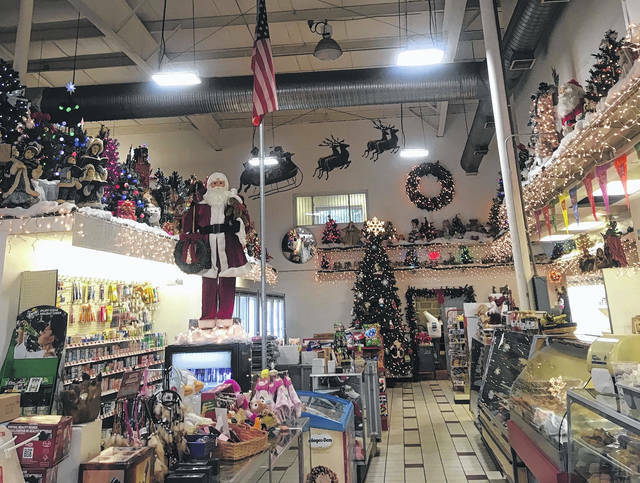 Those who lived there or in the area, will remember all the Christmas decorations that they squeezed in and displayed in that tiny store in the small town of South Webster. Shumway learned that Simmering’s were closing the store and contacted the Simmering’s (Vivian & Tammy) and told them she was interested in purchasing all of their decorations, they came to an agreement and Shumway traipsed out there and said that it took two or three Uhaul trips to move all of the decorations from South Webster to Lucasville. this giving Shumway a good start to her collection. Shumway mentioned that quite a bit of the displayed items are probably close to 50 years old. She was pretty sure that Tammy had handmade a Mr. and Mrs. Claus that is displayed, sitting by a fireplace, which gives one that wonderful feeling of ole. 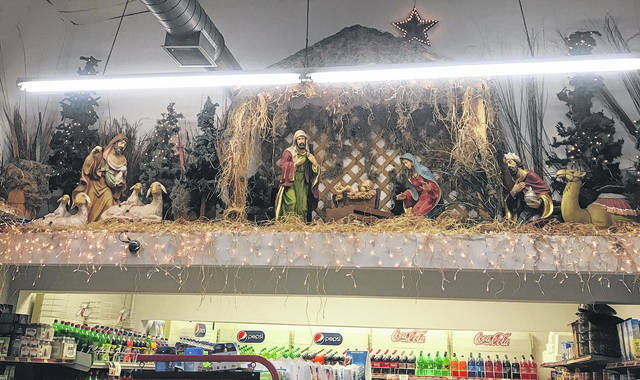 Upon entering the store, one sees everything from Winnie the Pooh, Woodstock, to the M &M guys, to a large nativity scene covering one entire section of the store. Shumway also said that some of the animated pieces have quit working, but they still are left in place, now resting unplugged but still adding to the beauty of everything. Shumway says that she adds something to her collection every year, but it was getting difficult to find a place to put any more things in her display. “We have people come from all around from Huntington to Columbus,” to see this fantastic set-up in this little store in the country. She said they start getting it ready at the beginning of October, due to the volume of things. And they try to have it ready to turn on the night before Thanksgiving. And then it runs steady, until the day after New Year’s. When that time comes, they cover everything that is up high with plastic and lattice, so that it is not visual and forgotten until the next year. Shumway was quick to say that she has never done this for the publicity, but to share the Christmas Spirit and joy with those who come and visit in the store. She said that Santa Claus himself, comes every year and has already been there this year. 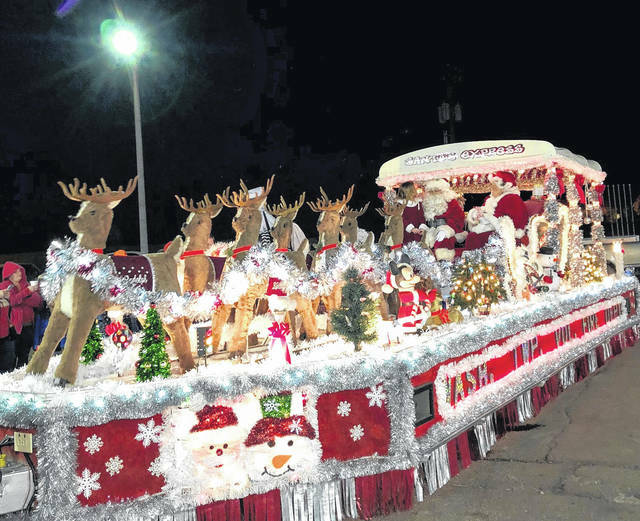 The Washington-Nile Fire Department has this big decorated sled and they bring it over with Mr. and Mrs. Claus are riding in this sled. The Briar Patch passes out treats to all the kids who are there (usually over 100 kids) come that night plus, they serve cookies with hot chocolate and coffee to the adults. The kids get to climb up in the sled with the Claus’s and to top it off, Shumway says they fill the treat with the old-fashioned treats that many people will remember of their childhood and and bring in some nostalgia, like orange slices, peanut clusters, gum drops and peanuts, because she wants it to be like an old fashioned Christmas. Young and old alike, would enjoy this Christmas in a store any time of the year, but for the time that it burst forth with life, until the last light it out, everything one can see brings something they can remember and share with others.